Aaron Valentine Stephens specialises in the design and making of handmade and totally unique Victorian-era glass signage and brilliant-cut glass panels. Combining the techniques of stone wheel engraving (brilliant-cutting), acid etching, wood carving, gilding and brush painting, Aaron’s designs catch the eye in every setting. Aaron completed his seven-year signwriting apprenticeship in 2014 under the tutelage of renowned signwriter and fairground artist Joby Carter of Carters Steam Fair, with further invaluable guidance from Joby’s old master Stan Wilkinson. 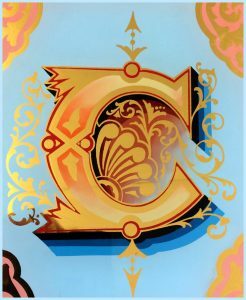 In 2015 Aaron attended world-famous glass gilder and artist David Adrian Smith’s signmaking class and was inspired to further develop the many skills of glass signwork in the following years, whilst continuing to work in Joby Carter’s paint shop, assisting with Carters’ first class fairground restorations.